Summertime calls for outdoor cooking/grilling, and enjoying fun activities with family and friends. You don’t have to wait for a special holiday or a celebration, to have a barbecue. You do it just because you feel like taking advantage of the warm weather, and cooking outdoors. Not to mention to give your husband a chance to show off his grilling skills, while you are relaxing with a nice cold drink while chatting with everyone (which most likely happens after you set everything up for him beforehand…). My son-in-law, with the assistance of my daughter, prepared these finger licking barbecue ribs, and they let me share this recipe with all of you. Cut ribs into small portions of 2 or 3 bones each. Season water a pinch each of salt, black pepper, and crushed red pepper to the water. Boil ribs in seasoned water for 20 minutes. Drain, and let the ribs sit for about a half an hour. Meanwhile, preheat an outdoor grill for high heat. Lightly coat the ribs with barbecue sauce. Cook the ribs over high heat for a 5 to 10 minutes on each side to get a nice grilled look to them. Place grilled ribs in a slow cooker. Pour remaining barbecue sauce and one bottle of beer over the ribs; this should cover at least half of the ribs. Cover, and cook on High for 3 hours. Stir to get the ribs on top into the sauce. The ribs are done when the meat is falling off the bone. The ribs were cooked completely in the first process, the rest is about flavor and texture. I love barbecue! anybody knows different ways/ingredients to make a barbecue tastier? 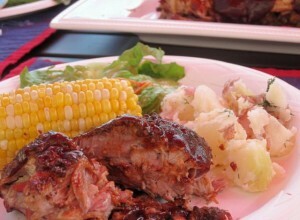 If you love to barbecue, your probably have mastered all the tricks of the trade, and prepare wonderful dishes.